WILL FIT MOST OF OUR CUSTOMERS – SKATE IN STYLE! Nothing but the best for our family of BABY SKATES customers! 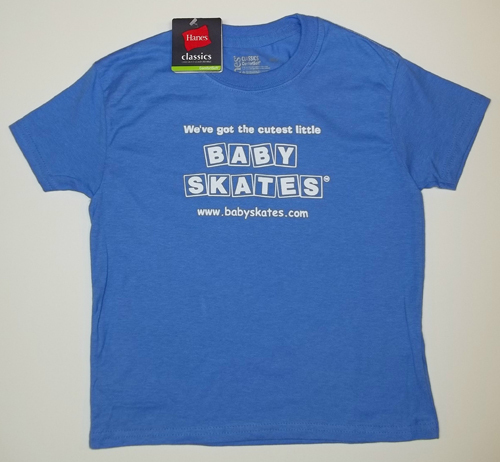 Our Tag-less BABY SKATES T-Shirt is by Hanes, it is a Hanes Classic - Heavy Weight style. Out t-shirt features ComfortSoft technology - super soft heavy weight - lay flat collar - that holds up really well! Comes in a really neat Sky Blue color that will look great on a little girl or boy. Our BABY SKATES logo and shout out is screened in a neat Bright White color on the front chest. Our t-shirt can be machine washed and thrown into the dryer, holds up very well with very little shrinkage. It is a size (XXS – 4).